My great uncle used to tell me stories about my great-great grandfather, William Miller, who grew up in Speyer, Germany before immigrating to the United States. He had been an altar boy in the city’s Romanesque Cathedral and considered studying to become a priest. He was drafted into the military of the newly formed German Empire, but decided to leave the country after witnessing a Prussian officer strike one of the other conscripts. He smuggled himself aboard a boat on the banks of the Rhine, following the river all the way to Rotterdam where he boarded a ship for America. He found work in Thayer County, Nebraska shoeing oxen at a fort. He later made his way back east to Wisconsin where he met Angenette Barth, my great-great grandmother. After they were married, they moved to Chicago, Illinois where William worked on refrigerator cars in the meatpacking industry. Angenette gave birth to four sons. By 1900, the family moved to Dunmore, Pennsylvania where William worked as a master car builder for the Erie Lackawanna Railroad. He rose up through the ranks of the railroad company and became wealthy enough to send all four of his sons to Lehigh University to study engineering (unfortunately my great-grandfather dropped out before graduating) and send financial support to relatives back in Germany. Back in 2004, I took a three-week, post-bar exam backpacking trip around Central Europe and visited the lovely town of Speyer. It was a thrill to see the Speyer Cathedral and walk the streets of this wonderfully preserved city. I had been researching family history since I was 12 years old, but the internet had brought me new discoveries. I found out that William’s parents names were Jacob Müller and Catharina Buchner. While in Speyer, I had hoped to see if I could trace them some more generations back. I stopped by the Speyer Stadtarchiv (Speyer City Archive) and was helped by very friendly woman who spoke excellent English and translated the registration records for me. I learned that William was an illegitimate child and that he had actually been born in Frankenstein, over 20 miles away, rather than Speyer. His mother, Catharina, had another illegitimate child with his father’s brother, Adam, and later married him and gave birth to seven more children. I also learned the names of Catharina’s parents, Franz Anton Buchner and Maria Barbara Weber. The woman at the Stadtarchiv recommended that I visit Frankenstein to see if I could trace the Müller’s back further, but unfortunately I had not budgeted enough time on my trip and needed to proceed on to Switzerland. After that, I told myself that I would come back and spend an extended amount of time in the area to see if I could find out more. 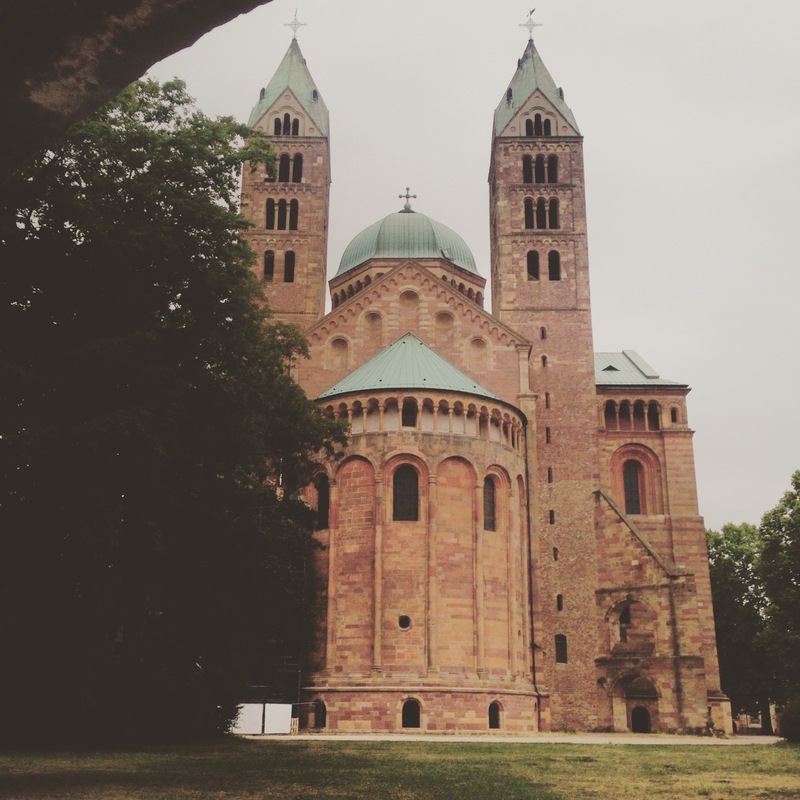 Eleven years later, I was fortunate enough to make a return trip to Speyer for several days. I was able to perform some additional research and visit some of the towns where the Müllers lived. I stayed at an AirBnB for five nights. The host had a bicycle, which came in handy for making my way around Speyer and exploring the region. My first stop was the Rheinland-Pfalz Landeshauptarchiv (Rheinland-Pfalz state archives). At the library, I tried to locate some of the church parish registers, but they were actually housed in other locations. The library has a list of parish registers online which provides location which you can find here if you open the PDF. The staff were nice enough to provide me with the locations of other city archives. They also had a book I was looking for about Ober Ingelheim, where my Barth ancestors came from. This allowed me to begin tracing them several generations back. I was able to ask my questions in my rudimentary German, but really wish I had better command of the language. The Landesarchiv told me that most of the records I was seeking were located at the Stadtarchiv. For some reason, Google Maps told me the Stadtarchiv was located several miles outside of the city. I recalled it being closer to the Cathedral, so figured something was wrong and asked the librarian where it was. The library told me that, indeed, it was located in the city center and just a short bike ride away. At the Stadtarchiv, the staff were still very helpful, provided me with a guide for reading the Sütterlin script in the records, helped translate some German words, and showed me some resources for figuring out where my ancestors lived Speyer and what they did for work. One of the records provided a lot of detail about the ancestry of the Müllers, stating that they were originally from Otterbach and Katzweiler. 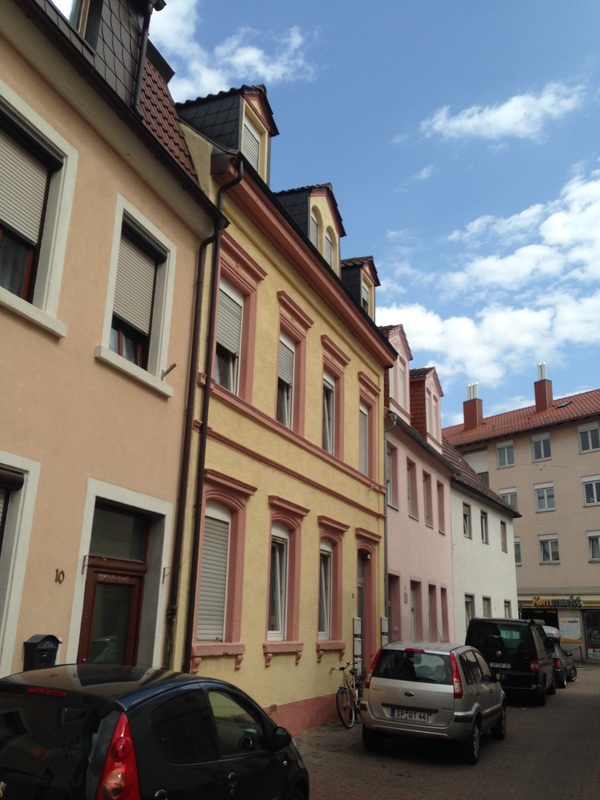 After leaving the Stadtarchiv, I went exploring the streets of Speyer to find the locations where my ancestors lived. Most of the houses were only a couple blocks away from the Stadtarchiv. I found the small house where Adam Müller lived when he first married Catharina Buchner, the larger house where Catharina’s parents lived, right across the street from where a famous artist named Hans Purrmann grew up, and also the house on Maximilianstraße where William’s spinster sisters Luisa and Emma lived and worked as seamstresses. Speyer survived the Allied bombing largely intact, so I felt fortunate to be able to see the actual buildings occupied by my ancestors. The following day I visited the Bistumarchiv (Diocese Archive), run by the Bishopric of Speyer. The staff there spoke good English there as well and also helped me out with some of the records. Initially I came here to research the Buchner family, but I found out that the Bistumarchiv has microfilm parish records for localities all over the Rheinland-Pfalz, so I decided to look for records of the Müllers in Otterbach and Katzweiler. They told me that Katzweiler records were placed in the same books as Otterbach, so I started looking there. 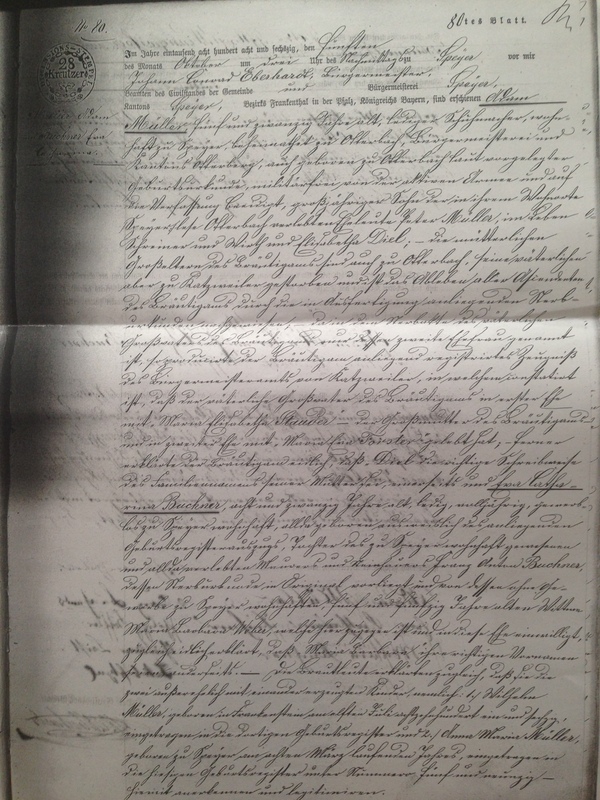 I managed to glean quite a lot from the Otterbach records, finding birth records of siblings, and tracing the Müllers another generation back. Here, most of the Catholic records were written in Latin, so it was actually much easier for me to read than the Sütterlin script and figure out the meanings of most of the words. They charged me a small fee based on the amount of time I spent researching there, but I thought it was well worth it. I decided to take the remaining time I had in Speyer to explore some of the towns the Müller’s came from: Katzweiler and Frankenstein. Luckily, all of these towns were along the rail line. It took a little over an hour to travel out to Katzweiler from Speyer. The train goes from the relatively flat agricultural lands of the Rhine Valley into the heavily forested and mountainous Pfalzwald, an area that resembles Pennsylvania. I changed trains in Kaiserlautern and followed another train out to Katzweiler. Otterbach was along the rail line, but it did not look interesting enough to make a stop. 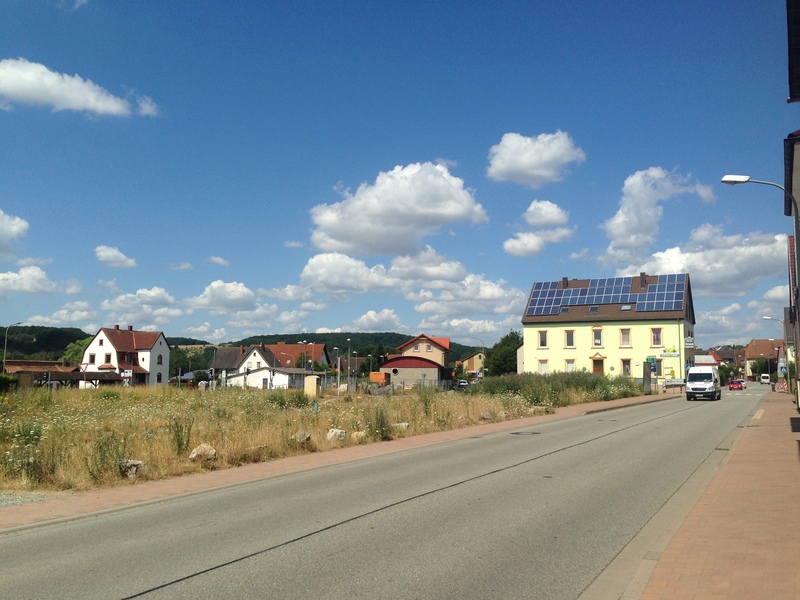 Katzweiler is a rural town on some relatively treeless hills north of Otterbach and Kaiserslautern. There was a small information booth in the town, but not many ways to learn about the history or note historic buildings. I visited one of the cemeteries, but as I later discovered, German cemeteries are usually not worth spending time in when doing genealogy. There is a headstone tax, so families usually have the stone removed after a few years in order to avoid paying the tax. Accordingly, most of the gravestones you will find in a German cemetery will be rather recent. 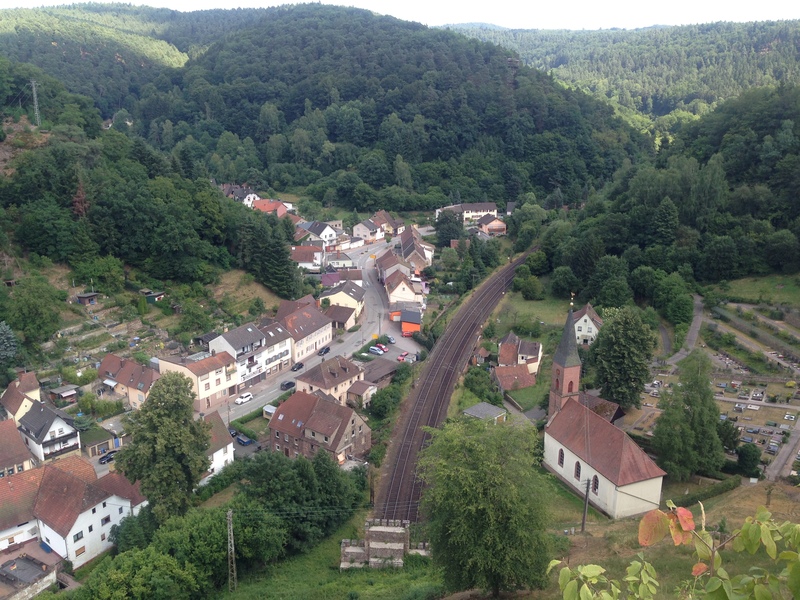 After snapping a few photos around Katzweiler, I boarded the train and followed it back to Frankenstein. Frankenstein was one of the more remarkably beautiful places on this particular portion of my trip. It is such a tiny town, I was surprised that it actually has a train station. It is a small town, nestled in a valley and overlooked by the ruins of a castle. The knights von Frankenstein had lived in the area since the thirteenth century. I could imagine my great-great grandfather playing in the castle ruins while he was a boy. As far as I know, there is no connection between this town and Mary Shelley’s Frankenstein. If I had more time in Speyer, I would have stopped at the Zentralarchiv der Evangelischen Kirche der Pfalz (Protestant Church Central Archive) to research my Protestant Weber ancestors who lived in Zweibrücken, but I will have to save it for another adventure. 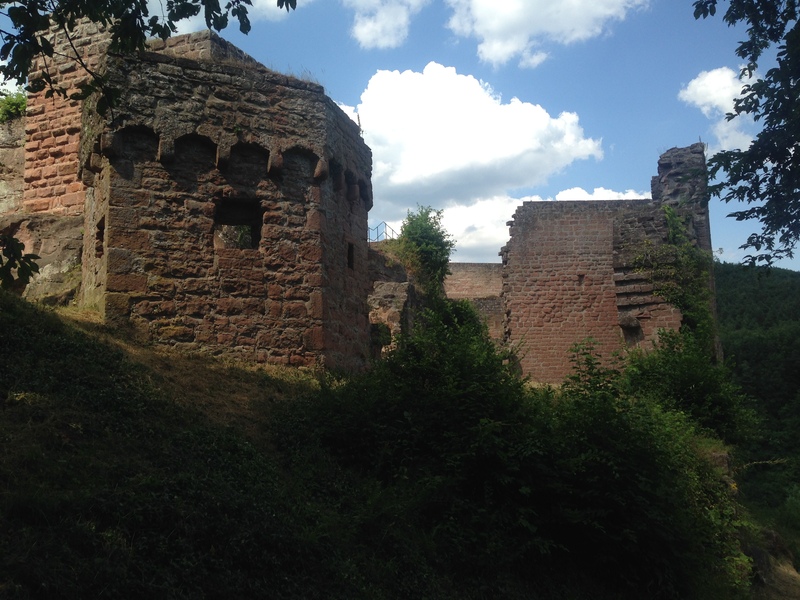 If you have ancestors in Rheinland-Pfalz, Speyer is a great base for doing your research and exploring the region. The city itself is worth exploring a day or two, especially the cathedral and the Jewish Museum. If you’re feeling adventurous, I highly recommend renting a bicycle and exploring the bike trails. I rode all the way to Heidelberg and back in a day. If you’re making a genealogy trip to Germany, try to learn as much as you can about the history, language and resources before you go. It will make your trip so much more satisfying. Santa Catarina and rural Rio Grande do Sul have much less crime and violence than other parts of Brazil, but definitely keep your eyes open, learn some Portuguese, and drive carefully. Gramado is very safe and is one of the few cities in Brazil where you’ll find upper middle classes houses without walls around them. Definitely visit the Cañion Itaimbezinho which is nearby. I’ve also heard good things about Praia da Rosa which you might be able to visit traveling between Floripa and Gramado. Weather wise September is early spring so the weather might be a little cool (by Brazilian standards), but you’ll have the advantage of it not being high season. The beaches of Floripa are stunning and I think you’ll really enjoy exploring the island.